Its a blend of sun-soaked hours, serene luxury and soul-soothing solitude. This proprietary blend, stirred by gentle trade winds, is at the heart of the Jumby Bay experience. An island arcadia enjoyed for nearly two decades, the resort is situated between the Atlantic Ocean and the Caribbean Sea and blessed with a gloriously temperate climate. With its towering palms, wild orchids, bougainvilla and lawns edged with pristine white sands, Jumby Bay is home to an astonishing array of wildlife and an ample reserve of privacy.Its a charming island playground infused with the atmosphere of an elegant house party, new arrivals are quickly seduced by languid pace of life on Jumby Bay. A morning dip in the sea, sunbathing at noon, or a game of croquet in the afternoon are accompanied only by the serene sounds of nature. 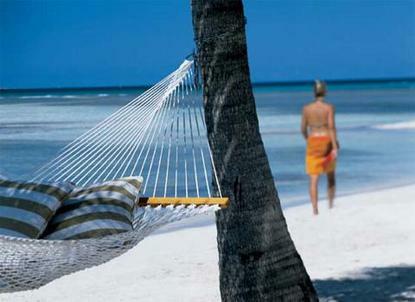 On an island without cars, guests move about easily in golf carts and bicycles along the island?s palm-shaded paths.Where sand, sun and revelry meet the postcard perfect white sands of Jumby Bays main beach are lined with thatched-roofs bohios and hammocks strung between stately palms. The Beach Bar provides convenient seaside services while the nearby Beach Pavilion, with its cabana-lined pool and tennis courts, is a gentle hub of the island. On the Atlantic side, Pasture Bay Beach is the islands most isolated and untamed seascape and a natural preserve for the endangered Hawksbill Turtle. Watersports, deep-sea fishing trips, scuba diving and snorkeling are just a few if the leisure choices at Jumby Bay. When civilization beckons, a short catamaran ride takes guests to mainland Antigua where shopping, casinos, Historical sites and golf await.